Story - 4: Ensemble books need storylines such as this one perennially. Group dynamics are challenging, and when you add superpowers and the motivation to save the world, while protecting the people, there can be a wee bit that needs to be relieved of. 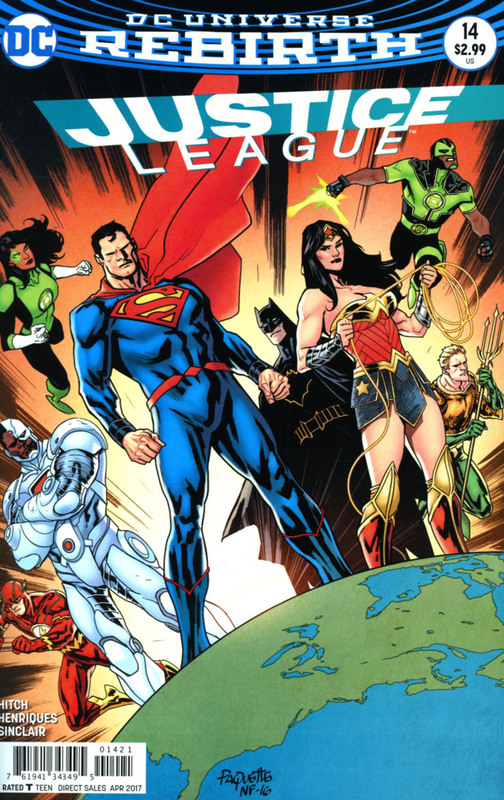 The energy of this Justice League is still somewhat uncertain, which is mainly due to the unsteady approach of Hitch in handling the characters individually and as a group. This installment reads more like an episode of the Super Friends, with a "done in one" agenda, to highlight a sub-plot as opposed to the standard story. Everyone gets a turn at confession and accusation, and while the dialogue is entertaining, it's altogether pointless at the end of the day. Flash states correctly, to Batman's concerns of a League gone rogue, that they would never do such a thing. Batman counters about mind control, Eclipso, etc., but Flash is correct, the Justice League would never do such a thing. 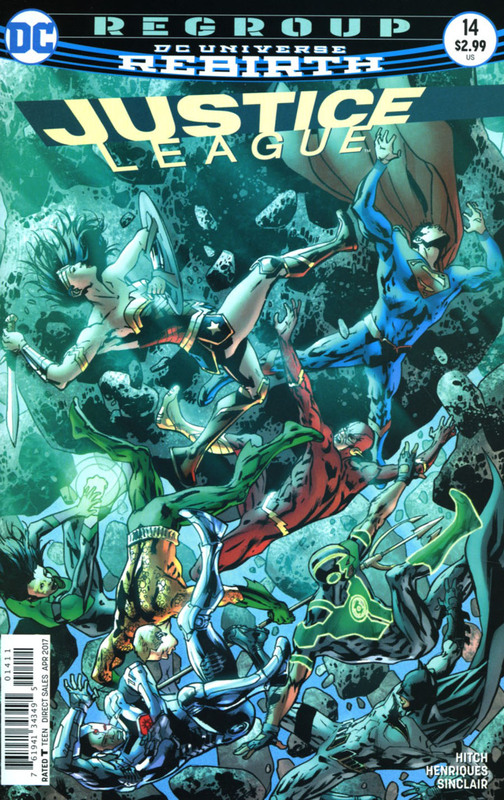 The other situations are contrivances to make the League fight so that readers can see whatever supposed clever failsafes the Batman has in store, or so Superman and Wonder Woman will fight... or some other hero vs hero malarkey. This issue should be a reminder of what the Justice League is supposed to be about, but as it is done in one, the likelihood is doubtful. The major problem with the story is the needless enervating of the League for it to happen. Flash can't vibrate through the pile-on. Superman is weakened, though he's powered by solar energy, and not merely sunlight. The Green Lanterns are reduced to tapers. Aquaman, Cyborg, and Wonder Woman are the only ones who are plausibly stifled. It's really a silly thing, as we know they will escape somehow, but it was also a lost opportunity to show them working together, being stronger as a unit, as opposed to the diaphanous reasons to just suit the plot. Art - 3: Hitch turns in some of his best stuff here, which is telling as most of the story involves mostly being stationary and talking. Cover Art - 3: It's just not an intriguing image.